"You are right. I did smoke cigarettes for a lot of years on my show. But I wasn't selling you motherf-in' cigarettes. I wasn't selling Smoking Tony dolls for your kids. You couldn't go to five or six casinos around the world and find the Tony Bourdain f-ing smoking section. And when I found a spot on my motherf-ing lung, I didn't wait three years so I could get a deal so I could sell you the Patch, OK."
Anthony Bourdain also called out one of Deen's more notorious concoctions, a bacon-and-egg-topped burger with donuts as buns. Do you agree with Bourdain? Well, if I was the "name" of a small industry that employed a lot of people, I might be a bit reticent if I acquired a malady that could be blamed on my brand, and risk the health of that industry. I don't think I've heard or read of anyone looking at the possible repercussions from that perspective. Note to Anthony Bordain, you didn't sell the cigarettes, but your glamorized their use, that's why you don't see them in movies and TV anymore.....go pick on another mean person. I have seen your shows -- all of them and I am in fact a fan of yours.. but to mock this woman and her empire.. seriously.. she is not forcing this food down any ones throats.. She is a self made human being .. so why pick on her.. do you know that the medical condition she has is genetic too? Why is it the one who has more faults than Paula could EVER have casts the first stone Tony? Not cool -- it makes me re think all the good things I ever said about you.. because you can sit in an ally with most simple in the world to the most arrogant.. and you pick on a woman from the South who started with NOTHING.. that is So WRONG at many levels. I think the Paula bashing should stop. I don't agree with what she did, but I think she paid the price in the media. Enough already. BTW, I'm not a fan of her cooking, but I do find her entertaining. I agree that she didn't shove that bacon cheeseburger down anybody's throat. I don't believe she deliberately set out to harm anybody. She's just making a living like the rest of us. If people choose to eat her ridiculous concoctions, that's on them. This is a woman who came from humble beginnings and worked very hard to get where she is today. Congratulations to her and shame on you Tony! U people r nasty! also u r wrong in the way u attack Paula, what she put out there about her diabetes was really no one elses business except her families. That is personal, private, no one else's need to know business! Leave her alone, there is really no reason that says she had to tell anyone any of her personal, private business information b it about her family or about her herself! So Back Off!!! U c she really didn't have to go public with her own personal, private information or business!! That kind of stuff is not to b put out there for people to c. That is not how or what u judge a person by. Leave her alone & move on to better things!!! I do not agree with the way Anthony is speaking out! ONE-I love Paula Dean and Anthony! BUT Anthony really where is your grace and mercy? YOU must not have ever had issues and your self-righteous words are uncalled for! WE americans do eat food that could harm us if eaten on a daily base but ....BACK off as you have not arrived nor will at this rate! We know what food to eat and we love the Southern Comfort foods! We can we in moderation! RIGHT? I used to be a fan of Tony's, but he's becoming an ever-increasing wang, as his popularity diminished. The shock-jock is funny for awhile, but no one wants to listen 24/7. As sad as having diabetes is, it doesn't change the fact that she's getting paid a lot of money to announce her diagnosis. What does it matter? Americans are stupid and overindulge then blame someone else for their problems. 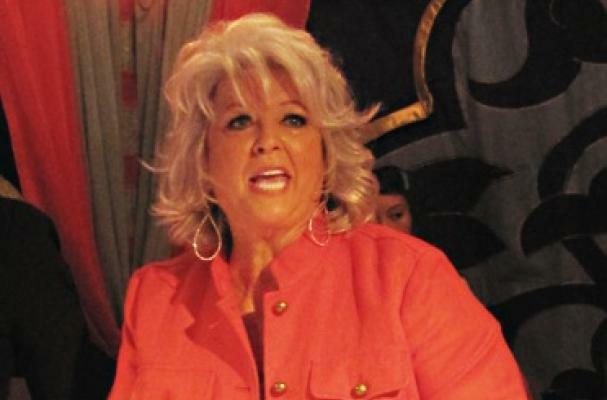 No one told America to eat like Paula Deen everyday. We have to find a scapegoat since we live in a society where NO ONE is ever accountable or responsible for their own actions or self! Also, what I have to keep reminding myself is that this really isn't about Bourdain vs. Deen, it's about Travel Channel vs. Food Network. If TC wasn't feeding (or at least encouraging) these comments, they'd have snapped Tony's leash and he'd have heeled a long time ago. This is a ratings gambit for their quickly tarnishing golden ticket...and the sympathy vote isn't hurting Paula, either. Having worked a LONG time in marketing...I wouldn't be completely shocked if we find out someday that this whole "fight" was planned out in a boardroom somewhere, lol. The guy could show a little more class and keep his mouth shut about Paula Deen. Just concentrate on your own cooking, dude and Ms Deen will look after her own. Sounds like me he might be a tad jealous of her popularity too.